Listed below we describe the focus of this site along with how we operate our Classifieds. Be sure to check out our Website Disclaimer below that for more detailed information. 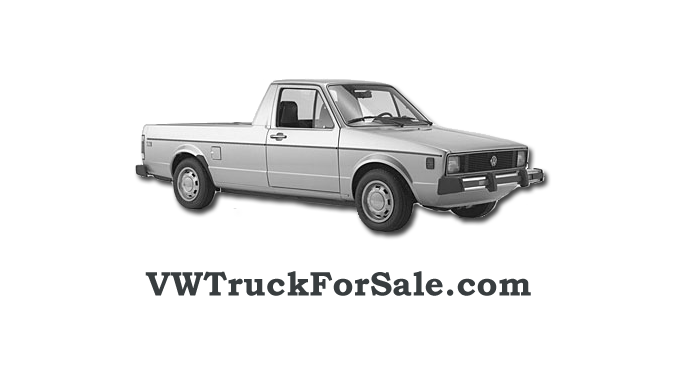 At the current time this site focuses primarily on displaying ads for 1st generation VW Rabbit Pickups which encompasses Caddy Trucks for models years 1980 through 1983. The current region targeted is America with segments by each state and city/area. Ads are posted directly to this site via sellers and are also reposted here from popular online classifieds sites such as Craigslist and eBay. The goal is to be a classifieds aggregation resources and a central hub for finding any classic VW Truck For Sale across the United States. As we look to be an online resource for buyers and sellers to see past sale prices of various Volkswagen Rabbit Pickups across the US; we do not remove the ads once they are sold. We do however, do our best to mark them as sold and remove the seller contact information. If you are a seller and would like your information removed from this site please contact us. View our Website Disclaimer information below for more details. You can use the “Classifieds Navigation” on the far right (Bottom for Mobile) to see our listings. See our Home Page to learn a little more about the VW Rabbit Truck. To get more information about where to find parts and the specs for VW Rabbit Pickups check out our Resources or Parts pages. Also feel free to continue reading below to learn a little more about how we manage this site. ***Warning – VWTruckForSale.com is not involved in the sale or purchase of any vehicle displayed on this site. Furthermore, this site is not responsible for the accuracy of the content posted here. It is the obligation of the buyer and/or seller to perform their own due diligence before conducting any transaction. VWTruckForSale.com is not liable for any damages that should arise through the use of this site. One of our goals is to be a research point for buyers and sellers to see the past Volkswagen Rabbit Pickups for sale in various states, cities and regions across the United States. For this purpose we do not remove old ad posts, but do our best to mark these as sold. Please note that we only do this when the seller contacts us directly. If you are the seller of a VW Truck Listed listed on this site and would like your contact information removed along with the vehicle marked as sold, please send us a message. Be sure to use the subject line “Sold Listing” to expedite the process. VWTruckForSale.com is not endorsed by the Volkswagen Group, Craigslist, eBay or any brand/company listed on this site. The use of the Volkswagen name and other trademarks is done so in compliance with the Fair Use clause of US Copyright Law. All trademarks and copyrighted materials belong to their respective owners. Images used on this site are both from various online sources including classified sites. No images on this site are owned by VWTruckForSale.com and all rights are reserved by respective owners. If you are the owner of an image featured on this and would like it removed, please contact us. The information presented on this site is not guaranteed to be complete, accurate or up-to-date. Additionally while we do our best to update this site regularly there is no guarantee of this or the continued operation of the site. Please contact us should you have any questions about this.